The 17-storey building brings an unmistakable gravitas to the neighbourhood. The dark and dramatic, stone-like base is paired with a luminous glass tower. Brilliant splashes of colour are scattered throughout, much like an immense painted canvas of a field accented with bunches of bright wild flowers. Musée has taken up residence in the midst of an historic part of the city. Where horse drawn carriages once clopped along cobblestone streets, Musée residents can now stroll gracefully along beautifully paved mews and saunter under heritage archways to be connected to a series of charming lanes and canopy covered walkways. Everywhere you turn, there’s an opportunity to discover and explore. A long pedestrian galleria showcases rotating art exhibits. Running the length of Musée, the galleria spills out onto Adelaide Place and the surprising delight of discovering an 8,000 square foot parkette enhanced by sculptural installations. Cars are noticeably absent from the landscape. Access to the underground parking is discretely tucked away, making Musée an extraordinarily people-friendly oasis in Toronto’s downtown urban core. From the comfort and convenience of your living space, Musée provides panoramic views of a city skyline bursting with beauty and excitement. Regardless of where your suite is located, enjoy stunning, world-class views of Toronto and beyond. To the east and west of Musée, relish in the sights and sounds of the city. To the south, enjoy the beauty of the waterfront. To the north, feast your eyes on the lush greenspace that connects the urban metropolis with its natural surroundings. As curator of your own existence, Musée awaits the arrival of your life’s work. Uniquely designed for this exceptional destination in downtown Toronto, the suites of Musée are dressed to impress with the freedom to complete the picture with your own personal style and creativity. A subtle colour-wash has been introduced into the wide-plank flooring to complement the custom cabinetry available in a variety of colours and styles. Granite or quartz kitchen countertops and a full-size fridge with a built-in look befit the modern kitchen layouts. White marble vanity counters in the bathrooms create an exquisite centrepiece in your spa-like retreat. Located just east of Bathurst on Adelaide West, Musée connects to the vitality of King Street West with picturesque pedestrian laneways that weave through the community. The ultimate urban adventure, King West is the destination of choice with the high-heeled crowds for stylish, high-end restaurants, outdoor patios, lounges, dance clubs and fashionable shopping. World-class sporting events await at the Rogers Centre and Air Canada Centre, acclaimed theatrical productions at The Princess of Wales and Royal Alex theatres, movies at TIFF Bell Lightbox and the Scotiabank Theatres, cultural events and performing arts at Harbourfront and small neighbourhood venues. Clusters of art galleries and artist ateliers draw you inside with exhibits and openings. Life is an installation at Musée where every day offers up a new collection of experiences and adventures just waiting to be explore. With the King St. streetcar right at your doorstep, you’re connected with public transportation to all points in the GTA via the Yonge/University subway line and GO terminal at Union station. The convenience continues with the Gardiner Expressway offering connections with the Don Valley Parkway, Queen Elizabeth Way and Highway 427. For those who enjoy flying refined, the Toronto Island Airport is moments away, and for those who enjoy the outdoors, The Martin Goodman Trail, one of Toronto’s safest and most scenic bike routes, is minutes from your doorstep. As founder and principal of Quadrangle, Les Klein is committed to the notion that urban design, city building and architectural excellence all play important roles in maintaining and enhancing the quality of life for the entire community. Established in 1986, Klein’s firm Quadrangle works with high-profile clients in media, hospitality, retail and other sectors, as well as leading developers of multi-unit residential projects. The company is known for its innovative residential developments for diverse populations, their adaptive reuse of existing structures and the creation of dynamic environments for ideas-based private sector entrepreneurs. A firm believer in sharing knowledge, Klein lectures extensively at professional conferences and seminars. In 1994, Les was inducted into the College of Fellows of the Royal Architectural Institute of Canada (FRAIC). He served as Chair of the Ontario Fire Code Commission and the Ontario Association of Architects (OAA) Complaints Committee, and currently sits on the OAA Discipline Committee. Renowned interior design firm Bryon Patton and Associates brings their creative expertise and unique flair to Musée. An absolutely modern design vision for this new community serves up a fresh play on tradition. Monochromatic minimalism with hues of white, truffle and charcoal give way to vibrant splashes of colour that echo the building’s exterior architecture. Ornate ceiling details, traditional moulding, and over-the- top elements contrast with the long, horizontal lines and high ceilings of the lobby and public amenity spaces that evoke the ambience of a comfortable art gallery. A large event space and media room overlooking the parkette entertain gatherings of over 100 people with a long bar, low modern sofas and big screen TV. On the 2nd level, a waterpark beckons with a long and leisurely lap pool, whirlpools, fair weather water bar, yoga retreat, steam rooms and a huge, well-equipped gym. 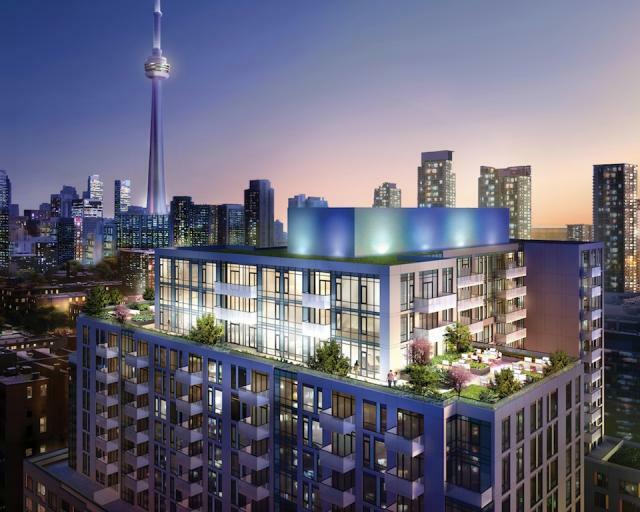 As one of Toronto’s most experienced condominium developers, Plaza has built over 7,000 condo suites in many of the city’s most desirable neighbourhoods. Every Plaza condo community strictly adheres to a philosophy of lasting value in architecture, interior design and materials – so you can be sure your home will be a place of lasting beauty. We were among the first to set the trend for including such finishes as granite counters, hard surface floors and stainless-steel appliances as standards instead of costly upgrades. We’ve continually raised the bar on delivering exceptional, hands-on customer service. Plus, we pay attention to detail because we know you do, too. That’s why so many Plaza buyers become repeat purchasers – and why you can choose your condominium home with complete confidence.